Many thousands of children who survived the Boxing Day tsunami lost their parents and siblings, as well as their homes and schools, in the disaster. On top of the psychological trauma, displacement has increased the risk to their health, and their education has been severely disrupted. 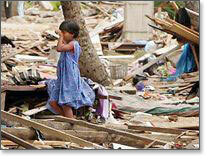 We have now established a Tsunami Childrens Fund. Its main objective is to provide sponsorship, scholarships and welfare activities to help orphaned and displaced children to live as normal and as fulfilled a life as possible. We aim to provide financial assistance, moral support, counselling and career guidance for as many affected children as we can, until they are old enough to be independent. Our sponsorship programme offers displaced and traumatised children a chance in life by providing regular financial assistance to cover their basic needs until they finish their education or reach the age of 18. It offers you the opportunity to sponsor a child and make a difference in his or her life. Every child needs accommodation and a safe environment, general healthcare and sufficient food, clean water and education. We regard these provisions as basic human rights but especially when children have lost one or both of their parents, these needs can often be denied in Sri Lanka. Your sponsorship can secure these basics, giving affected children the chance to live a safe, healthy life with the possibility to realise their full potential. It will provide real hope and fulfilment, both now and in the future. daughterThese children have been through immense hardships and psychological trauma. It made me aware of how lucky my little daughter is to live the way we do. says Dr Sujeewa Perera, from Belfast, who sponsors 11 year old girl, Sevvandi Sulochana. She lost her mother to the tsunami and lives with her father and younger sister. In a family that was left homeless and traumatized, Child Sponsorship ensures that little Sevvandi is not denied of education and other basic needs. Dr Perera added, I wanted to help in the long term. Share & Care Child Sponsorship seemed the best way. It is so rewarding to see the effects on an individual child and to know that Im a part of it." Your sponsorship will cost £10 a month and every penny will go to the sponsored child. Share & Care will make no deductions for administration. We rely on the dedication of our volunteers and where costs are incurred, they are paid for using the funds raised separately. Will my sponsorship go directly to those in need? Share & Care has a policy of only working with reputable charity organizations and local community leaders. With their help we have established mechanisms to ensure and monitor the wellbeing of children we are assisting. We understand that working in partnership with local communities is the key to lasting change. To become a Share & Care child sponsor, please contact us. You will need to complete a bank standing order form for the payments. If you have preferences on the gender and age of the child you wish to sponsor, we will do our best to meet your requirements. We will then send you the childs name and details. Can I contact the sponsored child? You are welcome to write to or visit your sponsored child and you may also consider sending them small gifts. This will enable you to learn about the child's life and the lives of the people in their community. You will also see how your sponsorship is being used and the very positive effect it will have over time. With the help of their schoolteachers, every 6 months we will send you updates on their progress. All this is only possible thanks to the generosity and commitment of people like you. You have the opportunity to offer displaced and traumatised children a chance in life. Please take this opportunity.